The HTC Titan II is equipped with a giant, 16MP autofocus camera with a wide-angle lens and a BSI (back-side illuminated) sensor. The end result is stills with a massive 4640 x 3480 pixels resolution to go with the equally massive 5-6MB file size. The handset also features a 1.3MP front-facing camera for self-portraits and video calling. The camera UI is pretty simple - you have your viewfinder and some controls on the right. From top to bottom they are the still/video camera toggle, second video-call camera toggle, virtual zoom buttons and an extended settings menu. On the left you have an arrow that takes you to the images taken with the camera; alternatively you can do a swipe gesture too. The camera app on Windows Phone offers very extensive settings, ranging from scenes and effects to white balance, contrast, saturation, sharpness, ISO and more. HTC have additionally added a number of shooting modes, including Burst and Panorama. There is intelligent auto as well, which, as its name suggests, picks the best camera setting for the occasion. We found it to work like a charm. The HTC Titan II image quality is a make or break for a handset that stakes so much on its camera. However, the photos we captured are nothing mind-boggling. They are some really decent photos with accurate colors and good contrast. Despite the 16MP moniker, the amount of resolved fine detail is not among the best we've seen and there's also lots of noise when viewing the photos at 100% zoom. Still, the images from the Titan II look pretty well when not zoomed at 100% so if you are not pixel peeping as we are, you will be perfectly alright with what comes out of the camera. Here go the HTC Titan II full-res camera samples. Keep in mind that (due to the sheer size of the files), they might take an extra while to load. We also took a couple of macro photos with the HTC Titan II. Here they are. Here's also an impromptu camera shootout between the 16MP HTC Titan II and the 8MP HTC One S for T-Mobile. As you'll see, when you open the images to just about fit your screen, the Titan barely has any resolution advantage. But that's to be expected. What's worse though, is that at 100% zoom the Titan II doesn't necessarily resolve more fine detail. In fact, when compared to the One S photos at 100%, the Titan II samples look more like upsized versions rather than something taken with a higher-resolution camera sensor. Perhaps it's not the camera sensor to blame, but the choice of cheap optics. As far as we can see, the HTC Titan II lacks sharpness and that hurts the competitiveness of its camera output. For all purposes practical, the Titan II is no better than the good 8MP shooters. Have that in mind when you're shopping around. The video camera interface is identical to the still camera one and has plenty of features too. You can adjust contrast, saturation and sharpness, change the white balance or exposure compensation and also add image effects. You can use the LED as a video light too. The HTC Titan II captures 720p videos, which look good. The framerate is nice and smooth and they are generally pleasing. The camera's autofocus feature can be a bit intrusive at times, but much less than, say, Nokia Lumia 900's unit. Here's an example of what the HTC Titan II's camcorder is capable of. We've also prepared an untouched 720p video sample from the HTC Titan II's camera for direct download. 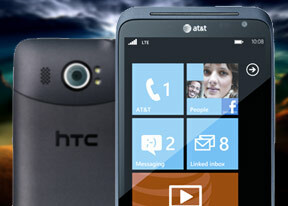 The HTC Titan II has quad-band GSM/GPRS/EDGE support and tri-band 3G with HSPA (14.4Mbps downlink and 5.76Mbps uplink). LTE connectivity is, of course, present as well. The speeds, which we've enjoyed on AT&T's network in the New York City area, were nothing short of impressive. Just keep in mind that your battery will take a serious beating when using it. The local connectivity is covered by Wi-Fi b/g/n with DLNA and stereo Bluetooth 2.1. Bluetooth is currently limited as to what it can do - there's no file transfer support, for one. Syncing with a computer is done with the Zune computer application. It's the only way to transfer files directly between your computer and your Windows Phone - there's no Mass storage mode, even now with Mango. You can sync files with Zune over the USB cable and Wi-Fi. There's a Mac version of available too - Windows Phone 7 Connector. You can check our detailed review of the Zune software here. Additional SD storage isn't available on Windows Phone so the HTC Titan II doesn't offer such an option. Another syncing option is the cloud. SkyDrive is a free Microsoft service that gives cloud storage for new subscribers. You can even have your photos automatically uploaded as soon as you snap them. Mango brings Wi-Fi hotspot functionality too. All you need is a data plan, which allows it and you're all set.